You know what’s really been bugging us lately? The fact that, so few people know how awesome and amazing insects can be! There are literally thousands of different species, and they each, in their own way, help the world grow and prosper every day. Sure, they all may not be the cutest little critters buzzing around but should that really have a lasting impression on how we treat them? No way! Show off your love for the insect class by dressing up as one of the more widely accepted and adorable species of beetles. 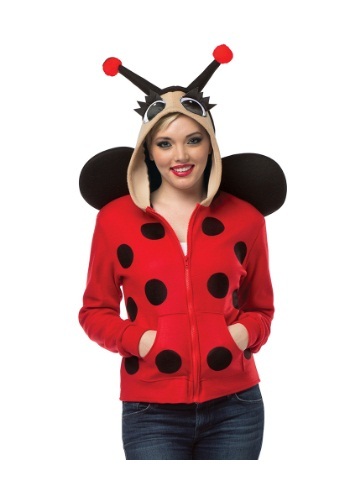 Walk around town in this Lady Bug Hoodie and you’ll slowly desensitize everybody’s irrational fears of insects. Cute little black wings are attached to the back of your shoulders with this hoodie and there are even adorable antennas along with a pair of big ole googly eyes sewn onto the hood. You’ll be the cutest bug jittering around the neighborhood once you add this awesome hoodie to your wardrobe!